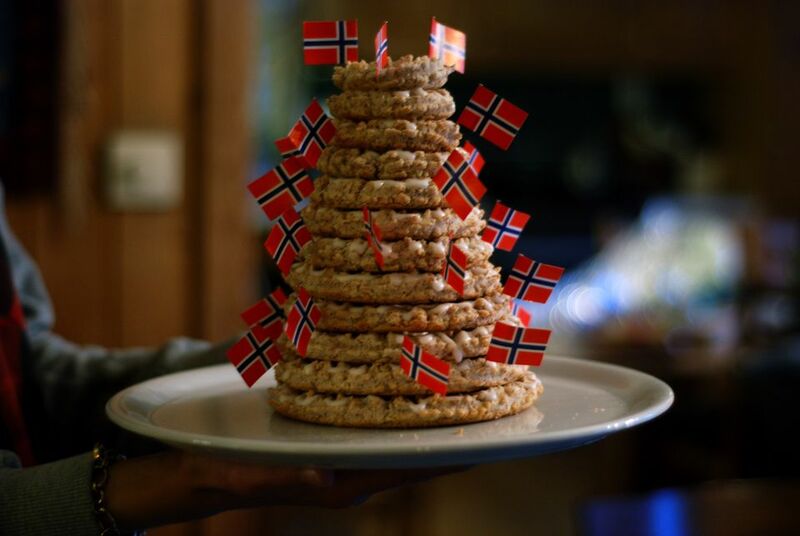 Kransekake, or "Ring Cake," is the signature cake of Norway, earning pride of place on wedding, birthday, graduation, and holiday banquet tables. Traditionally made from almonds, confectioner's sugar, and egg whites, it is a splendid flourless, gluten-free alternative to standard celebratory cakes. Bring water to boil in large saucepan, then add 1/2 of the almonds. Blanche until the nuts rise to the surface and the skins loosen about 3 minutes. Remove from heat, drain and rinse the almonds in cold water, then remove the skins. Spread them to dry on a paper towel-lined cookie sheet (Note: you can speed this process by putting them in the oven at low heat (about 170 F) for 15 minutes, but be sure not to let them roast). The nuts need to be completely dry before grinding. Grind the unblanched almonds in a coffee or spice grinder to form a fine flour (Note: do not use a food processor, which will over-process the nuts). Next, grind the blanched almonds. In a large mixing bowl, mix the two almond "flours" together along with the confectioner's sugar. Then, grind this combined mixture a second time. Once the almond flour is ground, place it in a large saucepan, stir in the 3 egg whites and almond extract, and place over a burner on low heat. Use a wooden spoon to knead the dough over the heat until it pulls away from the sides of the pan and shapes itself into a smooth, shiny mass (this step is exactly like making homemade play dough; the resulting almond paste is also the consistency of play dough). Place the almond paste in a bowl and refrigerate overnight. Preheat your oven to 400 F. Flour a pastry board or clean counter with potato starch flour; butter and dust six kransekake forms (if using) with potato starch flour. Roll the almond paste into 18 1/2"-wide "snakes," descending in length - in 1/2-inch increments - from about 20" long to 14" long. Fit the snakes into the forms, pinching the ends together tightly to form rings (Note: this dough is very forgiving, so you can easily reroll a few snakes if you've miscalculated the lengths so that they are evenly divided to fit the graduated rings of the kransekake forms). Alternatively, if not using kransekake forms, shape each of the 18 lengths into a ring and place on a parchment- or Silpat-lined baking sheet. Bake in the center of oven about 15 minutes, until the rings, turn a light gold. Watch carefully, as they will burn quickly if unattended. Mix together the confectioner's sugar, 2 egg whites, almond extract, and lemon juice to make a thick frosting. Place into a pastry bag (small tip) or in a plastic freezer bag with the end snipped off. Pipe the frosting in a wavy pattern around the circumference of the bottom ring (the frosting, while decorative, also serves as the glue that will hold the cake together). Repeat this step for each of the remaining rings, working from the largest up to the smallest. The finished cake will look like a Fisher-Price ring toy (but will taste far better!). Decorate the completed cake with flags and candies, as the Norwegians do, or with ribbons and edible and/or crystallized flowers for a special occasion like a birthday or wedding. Kransekake, like fine wine, improves by "aging" a day or two before serving. Store in a tightly sealed container with a slice of apple or bread in order to maximize this cake's unique soft-yet-chewy texture. It can also be made ahead and frozen. The ring tower can also be built in reversed order, with larger rings placed upon smaller ones, to form edible baskets. Scandinavian bakers also often invert the tower to form a cornucopia, which they fill with specialty cookies and candies.